Watermill Croft01677 423240work01677 423240fax Self-cateringWatermill Croft is a former stone built stable, converted to a high standard in a peaceful setting. Nestling beside the historic Crakehall Watermill and on the edge of the pretty village of Little Crakehall, near Bedale. A very comfortable one-bedroom single storey cottage furnished to a high standard and has French windows out onto the patio and garden. Open-plan sitting/dining room with gas 'wood burner effect' stove, bedroom (with king size 5ft bed), shower room with under floor heating. An ideal cottage to relax and unwind. Peaceful location at entrance to Wensleydale yet easy access from A1, also market towns of Bedale, Leyburn, Thirsk, Richmond, Masham and Middleham. Thorp Perrow Arboretum, Constable Burton Gardens and Wensleydale Railway are close by and well worth a visit. 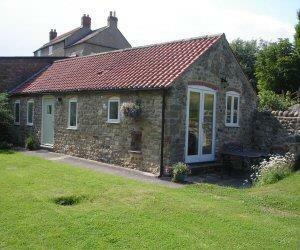 Ideal for exploring Yorkshire Dales and North Yorkshire Moors. Ripon and Fountains Abbey 30 minutes, York and Durham within the hour. Local walks direct from the house and quiet lanes for cycling. Local maps and books available to borrow. Selection of golf courses nearby: Bedale, Wensleydale, Richmond, Catterick, Northallerton. Wide choice of tea rooms, country pubs and award winning restaurants. Come and enjoy the beauty of North Yorkshire, whatever the season and relax!